Who else is ready for Spring break? Ya, me neither! Luckily, I’ve got a bunch of fun busy activities for kids planned, so I won’t be hearing ‘I’m bored’ constantly. 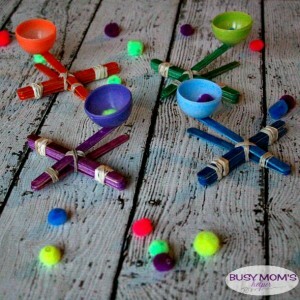 This Craft Stick Catapult is super easy to make – and really quick, too! The kids especially loved how they could customize it to be ‘their own’. Check it out! I loved this month’s craft lighting theme: busy activities for kids! We could all use some of these in our parenting arsenal, especially with the kids out of school soon. My kids are out a whole week – crazy! I’m excited for the play time we’ll get, but for the moments when I need to get some work done, I can rely on these fantastic ideas. Color the craft sticks with paint or markers, if desired. Allow to dry. Stack 5 craft sticks together, then use a rubber band on each end to tightly secure them together. Slide one craft stick above the bottom stick in the stack and pull through. Use a rubber band to secure the last craft stick on top of this one, at the end. Make sure it’s a bit loose, so it can stretch as you pull back the catapult. To keep it steady and secure, use the last 2 rubber bands to create an X around the middle of the catapult, leaving a little loose so you can adjust it. Use a dab of hot glue to secure the Easter egg half as a bowl to the launching end of the catapult. Allow to dry, then aim away! See, a super easy kid’s craft you can make, then enjoy for hours! Let them draw their own ‘target’ and have them practice their aim – show them how you can adjust the length of the stick and it will affect how high/far the ammo goes. Fun AND learning at the same time! Now head over and see the other fantastic busy bag crafts to keep kids happy with this month’s Craft Lightning!